Did you know that humans on Earth can have real life “BLUE SKIN” color? It’s called Methemoglobinemia and Argyria. There is a gene mutation in the way hemoglobin holds onto oxygen. There are many competitors for the way the iron in blood holds oxygen. There are additional proteins that facilitate that ability. One of them (out of many) includes cytochrome b5 reductase mutations (or lack of operational protein). That causes an increase in what’s called MetHb that can build up to a point where the blood does not have enough oxygen and grabs it from other locations to function. The result, the skin and inside the mouth turns blue. Argyria is when colloidal silver is ingested to significant levels to change to blue skin as a supplement. In human history, silver was used as a great antibiotic before there was knowledge of microorganisms. People who ingested silver eventually turned to blue skin. In modern times, several individuals have taken silver as a supplement and obtained similar results. Montana Libertarian Stan Jones was an unsuccessful candidate for the US Senate in 2002 and in 2006. He is also a victim of argyria. Jones began using colloidal silver he made himself in anticipation of antibiotic shortages predicted from the Y2K scare. He continues to take colloidal silver and believes in its health benefits. 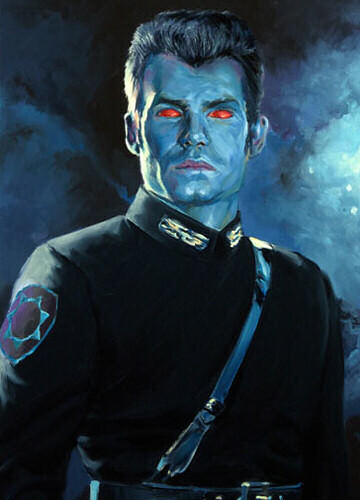 For the species CHISS which THRAWN is a member of, the EU canon states that the original species were human. It is plausible, that the Chiss crash landed and were marooned on a silver-nitrate-enriched environment. In order to survive, their cytochrome b5 reductase had to mutate or be deleted, which causes them to have blue skin. They must have a complete switch of hemoglobin to a different form for them to be able to breathe oxygen, but remain blue or not have it washout. Have 100+ generations (possibly strict cultural breeding programs, spelled: mates were selected), blue skin color genes were optimized and stabilized. Another caveat, it seems possible, that the treatment to avoid oxygen loss, is the early CHISS must have use the very treatment for methemoglobin, called methylene blue. But treatment in a biological system ultimately mutates genes for the next generation. After 100+ generations, the ability to breathe in an oxygenated environment and a higher nitrate environment or ammonium environment, to survive would be a permenent molecular switch on hemoglobin to include a methyline blue moiety AND the mutation/deletion of cytochrome b5 reductases. These mutations/deletions would have to be stable and not turn back to default human state. The addition of silver adaptation kept them alive on their new planet for generations. Moreover, most of other Chiss planets are gray and black, which silver nitrate would cause. But the water on Csilla depending on the salts can cause plantlife with a green chlorophyll to work. The red eye irises and sclera are a different gene mutation and possibly caused by different environmental factors. One idea possibly is the Chiss have higher sustainable blood pressures with less oxygen consumption. The other is the loss of iris eye color melanin to reflect the red. As a compensation, the vessel connections and the neurological transmissions are higher in Chiss. The reason why the Chiss are smarter besides selective breeding, is because of the environmental mutations. Please support our GET THRAWN IN STAR WARS REBELS campaign by signing our petition and participating on our blog, facebook and Twitter accounts. This entry was posted in Uncategorized and tagged #GetThrawnIn, #StarWarsRebels, Chiss, Get Thrawn In, Grand Admiral Thrawn. Bookmark the permalink.